Company sold 40,000 Harleys in Europe last year, more than anywhere else in the world except U.S.
President Donald Trump has used the American motorcycle maker as an example of a U.S. business harmed by trade barriers in other countries, but Harley had warned that tariffs could hurt its sales. The European Union on Friday began rolling out tariffs on American imports including bourbon, peanut butter and orange juice. The EU tariffs on $3.4 billion US worth of U.S. products are retaliation for duties the Trump administration is imposing on European steel and aluminum. The company said in a regulatory filing Monday that EU tariffs on its motorcycles exported from the U.S. jumped between six per cent and 31 per cent, adding about $2,200 US per average motorcycle exported from the U.S. to the EU. Meanwhile, Trump once again tweeted about the company on Monday afternoon, asking it to "be patient." White House press secretary Sarah Huckabee Sanders also defended Trump's trade policies Monday during a press briefing. 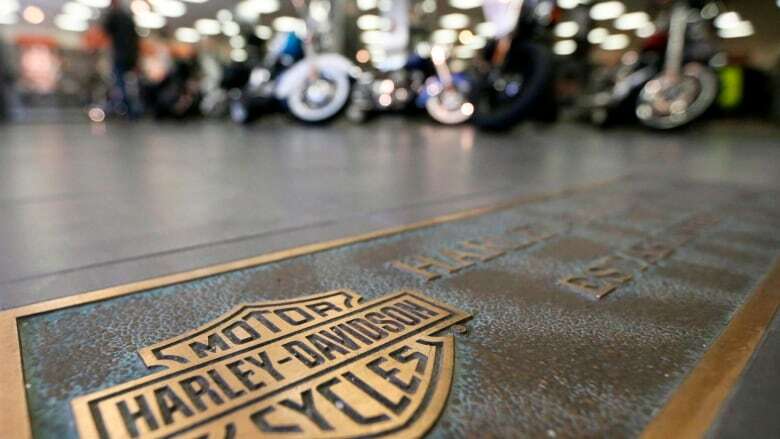 Harley-Davidson Inc. sold almost 40,000 motorcycles in the EU last year, its second-largest market after the United States, according to the company. The EU sales make up almost 16.4 per cent of Harley-Davidson's worldwide sales. In the U.S., Harley-Davidson sold 147,972 motorcycles last year, according to company data. Harley-Davidson said it will not raise its prices to avert "an immediate and lasting detrimental impact" on sales in Europe. It will instead absorb a significant amount of the cost in the near term. It anticipates the cost for the rest of the year to be approximately $30 million US to $45 million US. "Harley-Davidson's announcement today is the latest slap in the face to the loyal, highly skilled workforce that made Harley an iconic American brand," Robert Martinez Jr., president of the International Association of Machinists and Aerospace Workers, said in a statement. The union represents Harley-Davidson workers in Milwaukee, and the Kansas City and York plants. The Trump administration has started fights with trading partners around the world, imposing tariffs on imported steel and aluminum, provoking retaliation from close U.S. allies including the European Union, Canada, Mexico and Turkey. And it has announced tariffs on $50 billion US in Chinese goods — a tariff list that could swell to $450 billion US if Beijing refuses to back down and counterpunches with retaliatory moves. "This is further proof of the harm from unilateral tariffs," said AshLee Strong, a spokesperson for House Speaker Paul Ryan, a Wisconsin Republican. "The best way to help American workers, consumers, and manufacturers is to open new markets for them, not to raise barriers to our own market."